While following a proper diet, exercise plan, and medication regimen may seem tedious at times, here are four reasons why you should work together with your physician to get your blood pressure under control. 1. Heart Health: When your blood pressure is elevated, your heart is forced to pump harder against the increased resistance. Over time, this leads to higher rates of heart failure, myocardial infarction (i.e. ‘heart attack’), and sudden death. 2. Brain Health: High blood pressure is the most important risk factor for both stroke and intracerebral hemorrhage (i.e. ‘brain bleed’). This risk can be significantly reduced by keeping your blood pressure under control. 3. Kidney Health: The kidneys are susceptible to damage from high blood pressure. This can lead to Chronic Kidney Disease or even End-Stage Renal Disease that requires dialysis. 4. Eye Health: High blood pressure can damage the blood vessels supplying the retina of the eye. While most individuals do not have symptoms until late in the disease, this can result in dim vision or loss of vision. While this list may seem scary, the good news is that with diet, exercise, and the proper medication, it is possible to get your blood pressure under control. 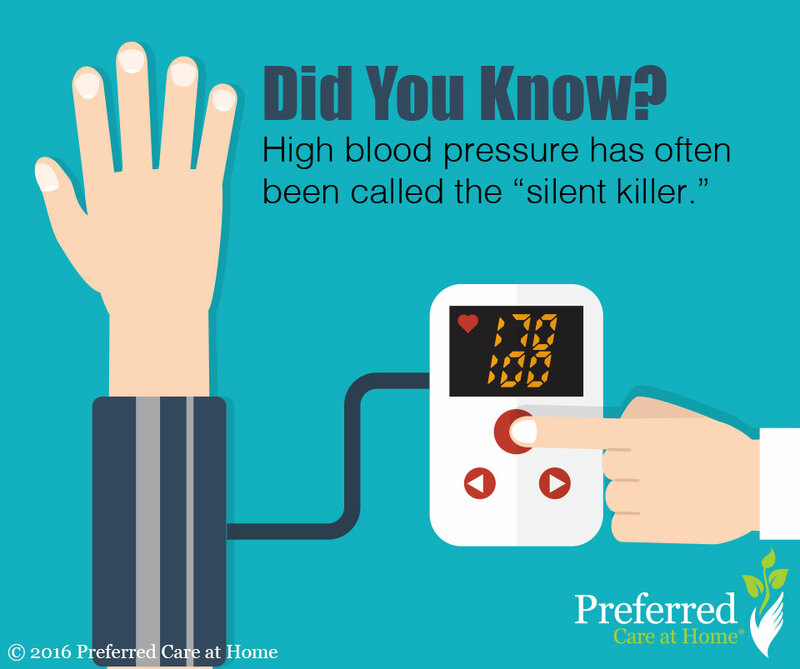 If you or a loved one have high blood pressure and need medication reminders or help cooking healthy meals, contact our office today to see how one of our compassionate caregivers may be able to help. *US Trends in Prevalence, Awareness, Treatment, and Control of Hypertension, 1988-2008. Egan BM, Zhao Y, Axon RN. JAMA. 2010;303(20):2043.